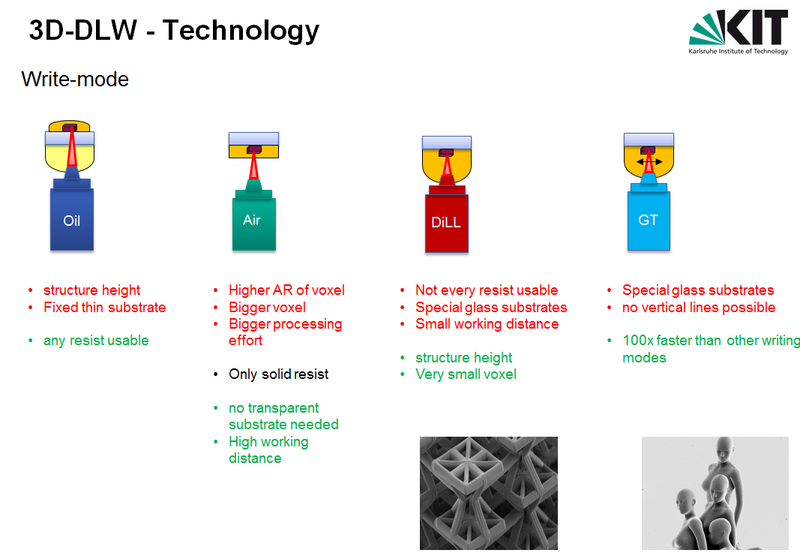 3D Direct Laser Writing is a tool to fabricate 3D freeform structures down sub µm. 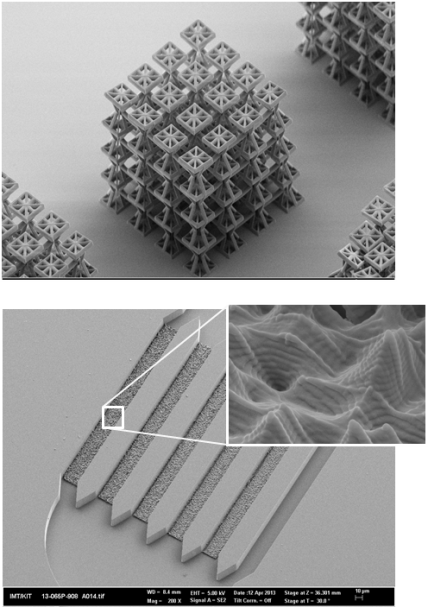 It is based on Two-Photon Lithography but beyond that 2D and 2.5D structures with nano dimensions are also possible. This system uses a nonlinear two-photon absorption process to modify, e.g. polymerize, a photosensitive medium at a specific point in the resist. 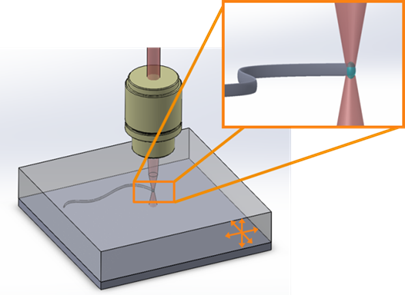 By scanning the photoresist with a stage over this point a 3D-structure with dimensions in the submicron scale or greater can be written. Experimental Resists are possible, but only the Air mode objective or oil-immersion Objective are applied. Dip-in techniques can only be used with proven compatibility. Other substrates have to be provided by the user. Sketch of the writing of a line in 3D-space inside a resist layer. The inset shows the modification in the voxel (blue) at the focal position. Only in the voxel two-photon absorption occurs. Sometimes CAD programs export erroneous stl-files. Solid works and similar programs used in mechanical engineering produce correct stl.files. - Think about plane orientation. Normals are used to define interior or exterior. Therefore contruct plane consistently. - In case of periodic structures a single unit cell is sufficient.